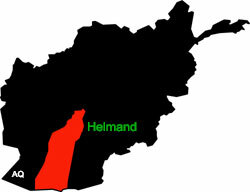 Afghan officials say 10 members of the country’s security forces were killed after the Afghan Air Force mistakenly dropped bombs on their position in the southern province of Helmand. Provincial Governor Hayatullah Hayat said on October 1 that at least nine police officers were wounded in the air strike in Gereshk district. Hayat said that an investigation is under way. “The air strike happened as Afghan forces were pushing to break through the Taliban front line in the strategic area that has been the scene of heavy fighting over the past several days,” the governor said. Gul Agha Muslim, a member of the district’s local council, said the victims of the air strike were from both the Afghan police and intelligence agency. Defense Ministry spokesman General Dawlat Waziri confirmed the air strike, without providing further details. In July, a U.S. air strike mistakenly killed 16 Afghan police officers and wounded two others in Gereshk district, which has seen heavy fighting in recent weeks between security forces and Taliban militants. The Afghan government is struggling to beat back insurgents in the wake of the exit of most NATO forces in 2014. A U.S. report found earlier this year that the Taliban controls or contests control of about 40 percent of the country, and security forces are also fighting against militants affiliated with the extremist group Islamic State (IS). In August, U.S. President Donald Trump announced a new Afghanistan strategy he said was aimed at defeating the Taliban after nearly 16 years of war. Defense officials say the president’s new strategy for Afghanistan will try to repeat the success of U.S. efforts over the past two years to strengthen Iraqi security forces against the Islamic State group with better training, logistical support, and the battlefield backup of U.S. artillery, and air strikes on enemy positions. The U.S. administration, which has confirmed it would send 3,000 extra troops to Afghanistan, is also pressing for NATO partners to increase their own troop levels in the country.